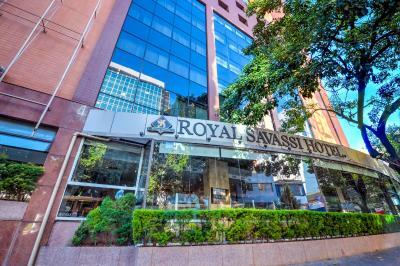 Lock in a great price for Royal Boutique Savassi Hotel – rated 8.6 by recent guests! 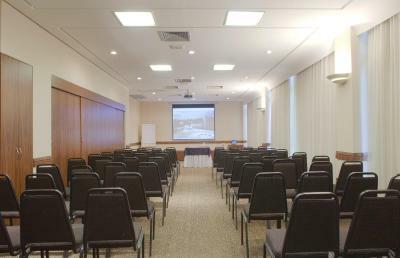 Excellent location, diverse breakfast, comfortable bed, clean room, great wifi connection in room, staff was very helpfull We had dinner in the restaurant Amadeus one night. 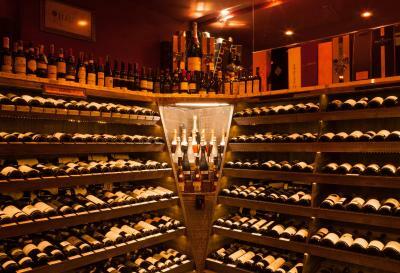 Great service and you get to choose your own wine from a selection of hundreds of wine bottles from all over the world. 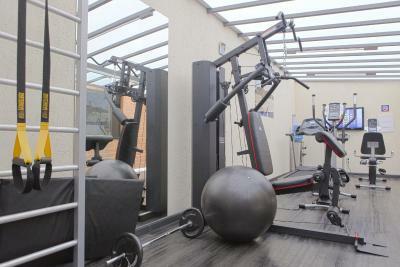 Great location, within walking distance of nightlife and shopping. 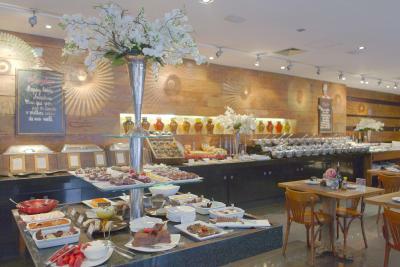 Breakfast buffet was good - with options including espresso and freshly squeezed orange juice. Pleasant, spacious & very well organized! The restaurant options & nearby stores are an extra bonus! I have stayed in this hotel before and enjoyed it so much we decided to stay there a few days prior to leaving B.H. Breakfast is outstanding, staff very friendly and helpful. Enjoyed and would recommend to anyone traveling and wanting to relax and the center of downtown B.H. 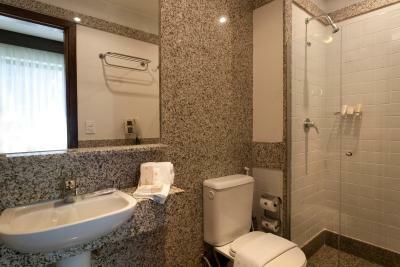 Great location, very clean, comfortable bed and excellent breakfast. 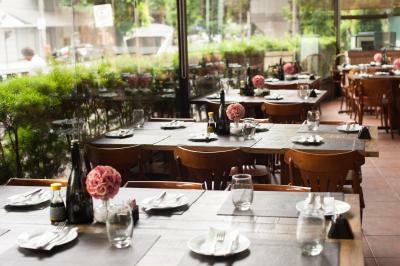 Location was excellent, with several cafes and restaurants nearby. Breakfast was good, however they use very tiny plates so I saw larger plates behind the plants on the same table and grabbed one of those so I didn't need to come back multiple times. When I had the larger plate in my hand and started going down the buffet line a woman came up to me and said that I couldn't use that plate and literally grabbed it from my hands! I mean...really? I spend almost $R 2,000.00 for 4 nights and I can't use the lunch plate for breakfast? That was odd and rude. The shower had great water pressure. The burger is actually good with fresh lettuce, tomatoes and crispy bacon etc....it just has entirely way too much cheese on it. Very reasonable price for room service. The front desk staff, specifically Sabrina....was great! The doorman and concierge were awesome as well. The concierge went above and beyond his duty to help me out with any/all request I had...Thanks for that! 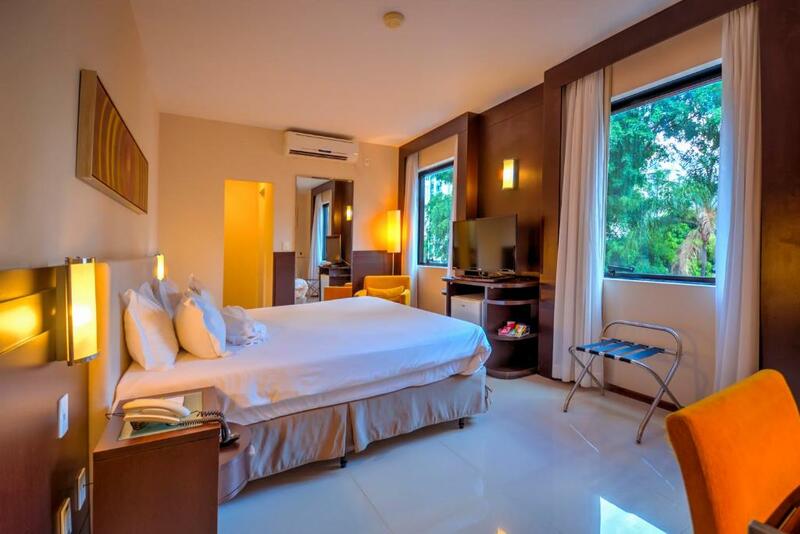 Royal Boutique Savassi Hotel This rating is a reflection of how the property compares to the industry standard when it comes to price, facilities and services available. It's based on a self-evaluation by the property. Use this rating to help choose your stay! 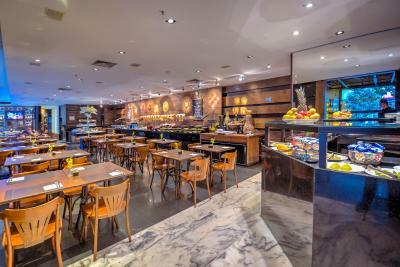 One of our top picks in Belo Horizonte.This pet-friendly hotel is in Belo Horizonte´s trendy Savassi district, just 0.6 mi from from Shopping Pátio Savassi and features a Brazilian restaurant and sauna. Free WiFi is available. The 4-star Royal Boutique Savassi Hotel offers elegant rooms equipped with soundproofed windows and carpeted or tiled floors. 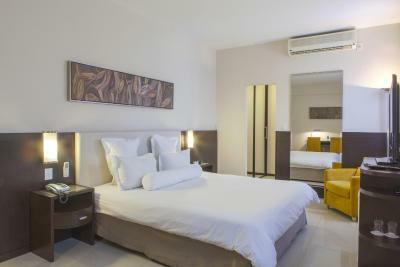 Amenities include air conditioning, cable TV, clock radio and mini-bar. Guests at Royal Savassi can exercise in the fitness center,relax in the ofuro tub and enjoy a rich buffet breakfast, featuring various tropical fruits and juices, fresh bread rolls and cakes. Hot items, such as eggs and sausages, are included as well. 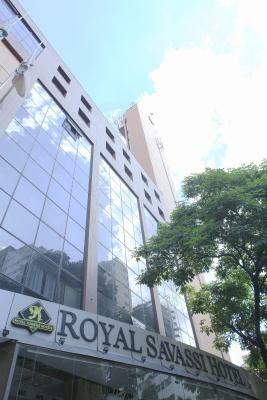 Royal Boutique Savassi Hotel is just 3 blocks from Afonso Pena Avenue, providing easy access to the main areas of the city. 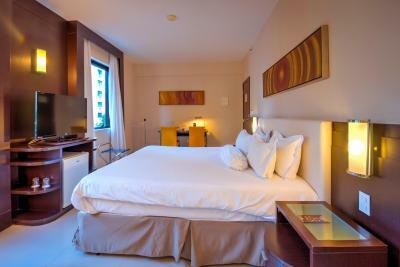 When would you like to stay at Royal Boutique Savassi Hotel? 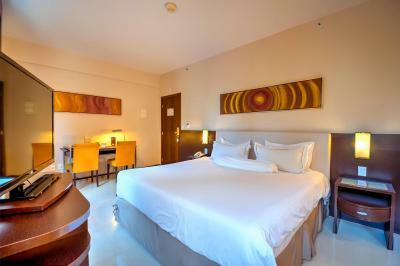 This air-conditioned room features a queen-size bed, soundproofed windows and carpeted or tiled floors. Amenities include a cable TV, clock radio and mini-bar. WiFi is free. 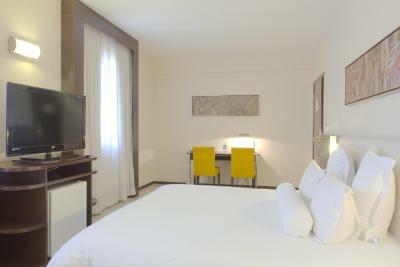 This room also offers free Trousseau amenities and Troussardi towels. 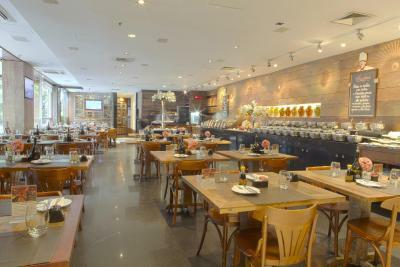 Guests are entitled to a bottle of Cambuquira water, a choice from the pillows menu, shoeshine and one piece of clothes press. 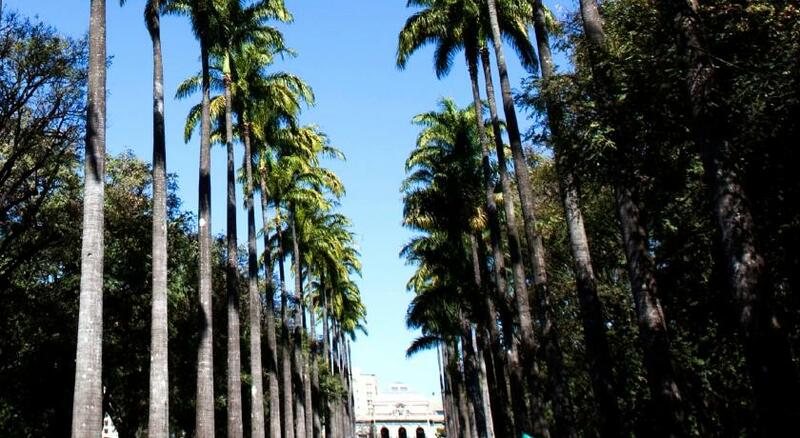 Private parking is available on site (reservation is not needed) and costs BRL 28 per day. 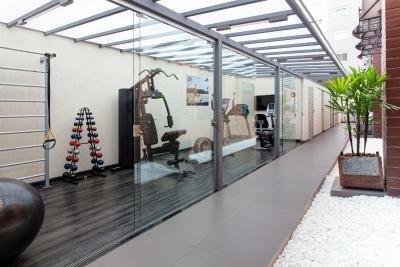 This air-conditioned room features soundproofed windows and carpeted or tiled floors. Amenities include a cable TV, clock radio and mini-bar. Wi-Fi is free. This room also offers free Trousseau amenities and Troussardi towels. 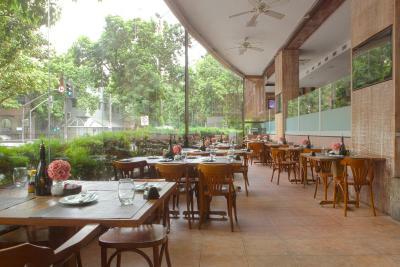 Guests are entitled to a bottle of Cambuquira water, a choice from the pillows menu, shoeshine and trousers press. This room type is located between the 6th and the 15th floor. 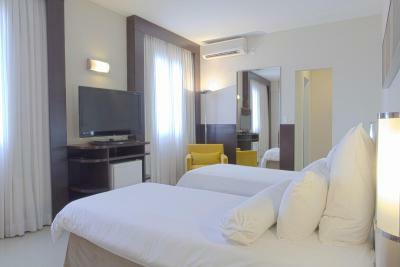 This air;conditioned twin room has a cable TV, soundproofed windows and mini-bar. It also includes towels and bed linen. 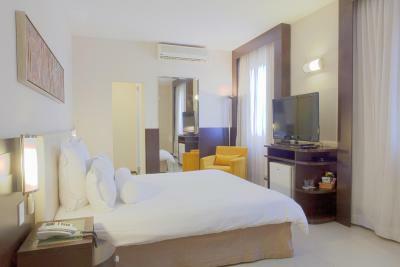 This room also offers free Trousseau amenities and Troussardi towels. 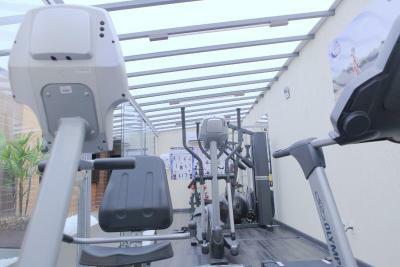 This type of room is located between the 1st and 5th floor. 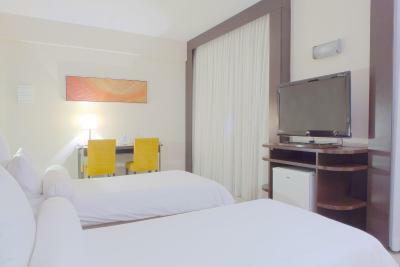 This double room has air conditioning, mini-bar and soundproofed windows.It also includes a TV and a security deposit box. Bed linen and towels are provided. This room type is located from the 1st to 5th floor. House Rules Royal Boutique Savassi Hotel takes special requests – add in the next step! 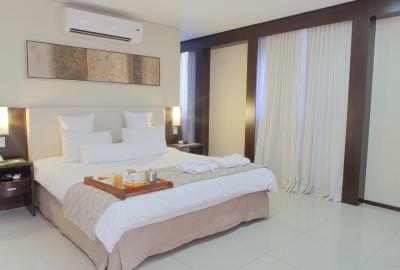 One older child or adult is charged BRL 69 per night in an extra bed. 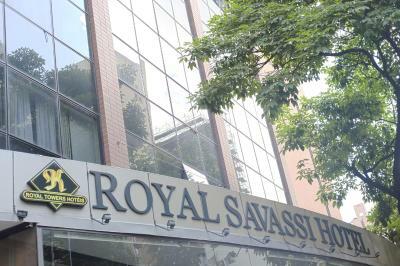 Royal Boutique Savassi Hotel accepts these cards and reserves the right to temporarily hold an amount prior to arrival. * The noise from the air conditioners just outside my room (102). Also the hot water in my room took ~5 minutes to come through, while my colleague in room 502 had no such issues. I personally will never stay here again and I recommend you don't either. The first issue started within seconds, the remote wasn't working so the concierge came and fixed it, which was spinning the batteries around to try and get a better charge. That is what I had to do the entire trip and why they didn't just put new batteries in it is strange. Once the TV was on the only international channels in english were CNN/BBC...I would have expected a better channel plan from a hotel in Savassi at that price point. The picture on the TV was horrible as well. Next....after settling in it was time for a shower. So I get in and turn the water on and guess what???? NO hot water at all! Someone come to fix it. Now the cold side was the hot side etc. on the shower knob. The next morning I was sleeping and at approx. 8:00am the door buzzer goes off/very loud! I had put the "Do Not Disturb" placard on the door but apparently the cleaning women don't pay attention to those. Ok, so after this I was awake and decided to take a shower....when I got out and went into the room to sit on the bed to put my shoes on I noticed dirt and hair and what appeared to be a dead bug wrapped in hair at the end of the bed where your feet would be while sleeping. I freaking lost it....there was a lot of hair/dirt and who knows what all over the bed. I thought the cleaning person hadn't changed the sheets before my arrival....disgusting! So I complained to the front desk and the concierge came to see and said "wow" not good. He had the person come change the sheets etc... and I on went my day. Later, after some Carnaval fun I came back and took another shower..I walked into the room barefoot and again sat to put on shoes and noticed my feet were black with hair all over them! I found out they only deep clean the carpets 2x per year and that's it! They do not vacuum their rooms at all!This is gross and unsanitary. Friendly and helpful staff that did everything they could they make us feel comfortable on arrival. 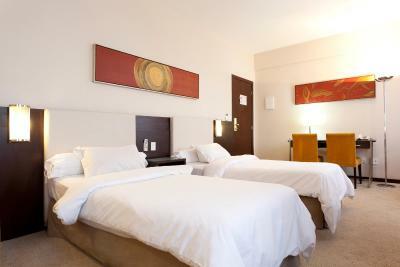 Hotel had comfortable well specified rooms and good facilities in a convenient down town location. Excellent breakfasts in the restaurant. Disappointed! I do not recommend hotel at all! They charge me twice and they were not clear about certain charges. Bad customer service. Odd smells in the hallways. Many maintenance issues. 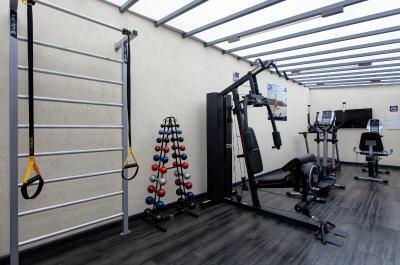 The gym could be better. Wifi connection is very poor. We didn't appreciate the taxi (recommendation and reservation made by the hotel) who drove us to the airport: he was reading his phone while driving and we were obliged to tell him, no possibility to pay with a credit card (and it was mentioned OK before leaving), he left us at domestic departures even of we mentioned that we were going to international ones. Great location and a very good service at the reception. Sabrina was really helpful and provided very good recommendations and advices. Thanks to her.